If you are unsure as to which campus to make application, please visit our Reynolda and Bowman Gray academic program pages for a complete list of master programs and PhD Tracks as well as their campus location. Applicants who wish to take graduate level classes on the Reynolda campus should complete the on-line application. Applicants will be required to submit an official undergraduate transcript to the Graduate School. Upon receipt of your application and transcript, a letter will be sent to you with instructions for registration. Registration will require permission from the course instructor. Uploaded Statement of Interest – the statement of interest should be approximately 300-600 words describing how you expect the Graduate Certificate in Bioethics will relate to your current and/or further work and interests. Students wishing to change from the Graduate Certificate to the Master of Arts will be expected to qualify for and apply to the degree program. Successful completion of the Certificate program does not guarantee admission to the Master of Arts degree program. …For students holding a MA, MS or MBA degree, a Postgraduate Certificate in Teaching Interpreting is available. … A student who wishes to complete three certificates can meet the requirements for a MA in Interpreting and Translation Studies. Uploaded Statement of Interest – including your background in teaching and in interpreting/translation. 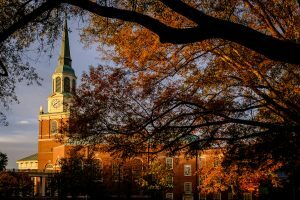 Please access the following link for information regarding Program Specific Requirements: http://interpretingandtranslation.wfu.edu/certificates-offered/. Taking courses as an unclassified student is only available to individuals who live and/or work in the local community and are not seeking a graduate degree. Complete the application and return it to the Graduate School office along with a non-refundable application fee of $75. Make check or money order payable to Wake Forest School of Medicine (WFSM). After submission of the application, obtain the course instructors permission. Once the Graduate School has received confirmation from the instructor you will receive confirmation of enrollment. Prepare a check (payable to WFSM at registration) in the amount of $1,340 per course hour or $110 per course hour audit fee. Payment must be made before the first day of class. Employees taking courses may receive a break on tuition. Please inquire at registration. If the department is paying the tuition, note the account number on the registration form along with the authorized signature. Meet the requirements for immunizations (print forms below, complete, and return to Employee Health).